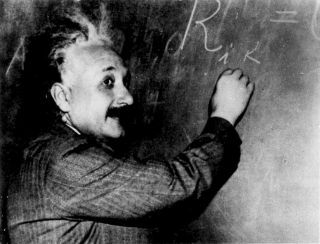 Albert Einstein at the blackboard. Alan Brown, writer and blogger for The Kavli Foundation, contributed this article to Space.com's Expert Voices: Op-Ed & Insights. What kind of universe do we live in? Dutch physicist Ronald Hanson has given us the best answer to that question yet — and Albert Einstein wouldn't like it. The question revolves around a phenomenon called quantum entanglement, which predicts that changing one entangled particle instantaneously changes the other — even if they are on opposite sides of the galaxy, 100,000 light-years apart. Aerial view of the Delft University of Technology campus, with location of the labs used to test "spooky action at a distance" highlighted. On the far left is location A, housing one of the two diamonds. The other diamond is housed on the other end of the campus, on the right of the photo. The beam-spliter, at location C, is located in the middle. Aerial photograph: Slagboom en Peeters Luchtfotografie BV. Einstein called this idea "spooky action at a distance," and he dismissed it, arguing that nothing could move faster than light, so entanglement couldn't be real. Instead, he proposed that unknown "local factors" must determine the strange properties of these so-called entangled particles. So how did Hanson prove him wrong? He conducted an experiment that builds on the work of a physicist named John Bell. In 1964, Bell argued that Einstein's theory could be tested by separating a pair of entangled particles far enough so that local forces could not act on both of them at the same time, and by seeing how often their properties correlated. Physicists would also have to take enough measurements to prove their results were statistically valid. A forest of optical elements to guide single photons from, and laser beams to, each diamond in the entanglement experiment. Quantum entanglement also has a practical side. It could be used in communications, computing and, especially, cryptography. It might provide a physical basis for protecting privacy in ways that can never be broken. On Thursday, Nov. 5, from 1 p.m. to 1:30 p.m. EST (10 a.m. to 10:30 a.m. PST), The Kavli Foundation will host a Google+ Hangout to discuss more about our surprising quantum universe, and how we can turn theory into practical engineering. Submit questions ahead of and during the webcast by emailing info@kavlifoundation.org or by using the hashtag #KavliLive on Twitter or Google+. Watch the discussion at the kavlifoundation.org. Ronald Hanson is the Antoni van Leeuwenhoek professor at the Delft University of Technology in the Netherlands, and a member of the school's Kavli Institute of Nanoscience. He has conducted the strongest test of quantum entanglement to date. Renato Renner heads the Swiss Federal Institute of Technology (ETH), Zurich's Institute for Theoretical Physics, and the Quantum Information Theory (QIT) Group. He is a leader in applying quantum physics to data security. Alan Brown (moderator) is a freelance journalist and writer who specializes in science, engineering and technology. He has been covering nanoscience and nanotechnology for more than 25 years.